...... quality at speeds up to 5x. Macsome iTunes Converter is a powerful iTunes converter to convert any audio files which could be played on iTunes. The conversion is 5X speed fast, and output could be CD Quality. It's an M4P to MP3 converter, iTunes to MP3 converter, AAC to MP3 converter. Macsome iTunes Converter for Mac converts any audio file from iTunes on MAC OS X to MP3 or AAC files. Batch converts DRM protected or unprotected MP4 or AA to unprotected MP3 or AAC files with ID tags preserved. 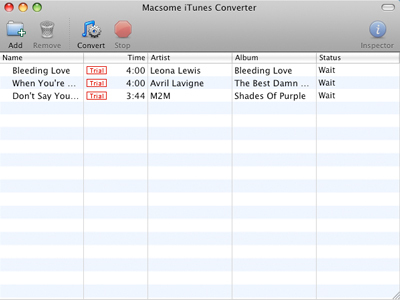 Macsome iTunesConverter works with iTunes and sound recording technology to convert iTunes audio file. So it keeps the users on the legal side. If you want to split the output MP3 or AAC files to small pieces, you may download and free use AudioSplitter. After finished converting your iTunes music or audio file to MP3 or AAC files, you may split them into several small pieces, to fit your portable MP3 player. Qweas is providing links to Macsome iTunes Converter for Mac 1.5.6 as a courtesy, and makes no representations regarding Macsome iTunes Converter for Mac or any other applications or any information related thereto. Any questions, complaints or claims regarding this application Macsome iTunes Converter for Mac 1.5.6 must be directed to the appropriate software vendor. You may click the publisher link of Macsome iTunes Converter for Mac on the top of this page to get more details about the vendor.